Baggy Eyes, Meet Japanese Gadget | OhGizmo! Nothing says aging, excessive drinking, smoking and lack of sleep like bags under your eyes. You can try to rock the look… or do your best to get rid of it. Sure, doing less of the things that give you bags to start with would seem like a good idea, but life’s too short to sleep or not drink. Right? So stick some Japanese gadgets under your eyes for three minutes a day and see what happens. This device, called “Eye Slack Haruka”, has two modes “Hard or Soft”. In the former setting, your eye luggage will be receiving mild electric stimulation while in the latter setting, it’s gentle heat and vibrations. Although this is Japan-only, importer Japan Trend Shop does carry it, albeit it at a steep $132. Can we suggest cucumbers instead? Pun at the end strikes the cord! 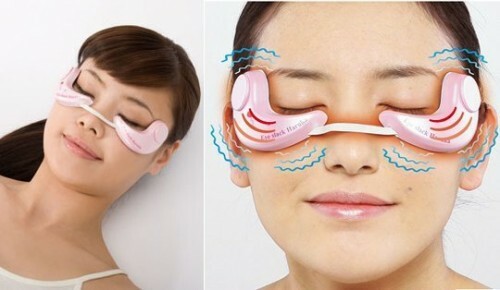 But apart from the benefits, could it have any side effects, because it looks as an interesting gadget for tired eyes. You know… I have no idea. I can’t imagine this being too dangerous… but if you end up getting it, you have to tell us how it is! Mr Smart from The Specials invented these.